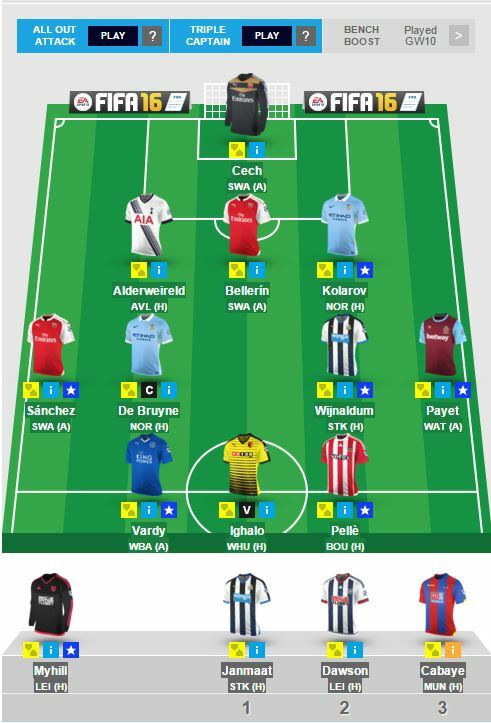 Our defenders this gameweek consist of Toby Alderweireld (5.3), Aleksander Kolarov (6.1) and Hector Bellerin (5.9). Alderweireld has been picking up some great run of form in recent games and with Spurs playing their game against Aston Villa, chances of keeping a cleansheet seems pretty high. Kolarov had a great game last week, which resulted in his team going reclaim the table topper position. This week City face Norwich city who have had a very bad run of games in the recent past, so I’m hoping for a consolation goal to go with that clean sheet as well! Bellerin is in the squad for the right reasons, this lad is slowly building a reputation for being touted as the best RB in the league. Well, only time will tell us whats what. The reserves this week in the defensive positions are Daryl Janmaat (4.9) and Craig Dawson (5.1), both being restricted to the bench owing to slightly tougher fixtures. The midfield remains strong as ever, leading the pack is Alexis Sanchez (11.6) who has had a one week break before this weekend’s game. Arsenal face Swansea (which I have already noted) which is going to be a really interesting game. Kevin De Bruyne (10.6) retains the title of the ‘wonderkid on the block’ and has a bright chance to shine tomorrow against Norwich City. Dimitri Payet (8.3), well, has been on a great run of form which has helped his team claim a spot within the top 5, while Georginio Wijnaldum (6.9) gets another chance to shine in this weeks game against Stoke City. Warming the bench for FFT this week is Yohan Cabaye (6.6) who unfortunately for himself is injured with little chances of playing. Now for the strikers – Grazianno Pelle (8.5), Jamie Vardy (7.2) and Odion Ighalo (5.4) are FFT’s strikers for this week, and all of them feature in the playing 11. Reasons for our selection being top scoring forms which means more points! Hope this week’s selections help. A bit scary, but that’s just ’cause it comes with the Halloween flavour. Happy Halloween boys, have a great gameweek!